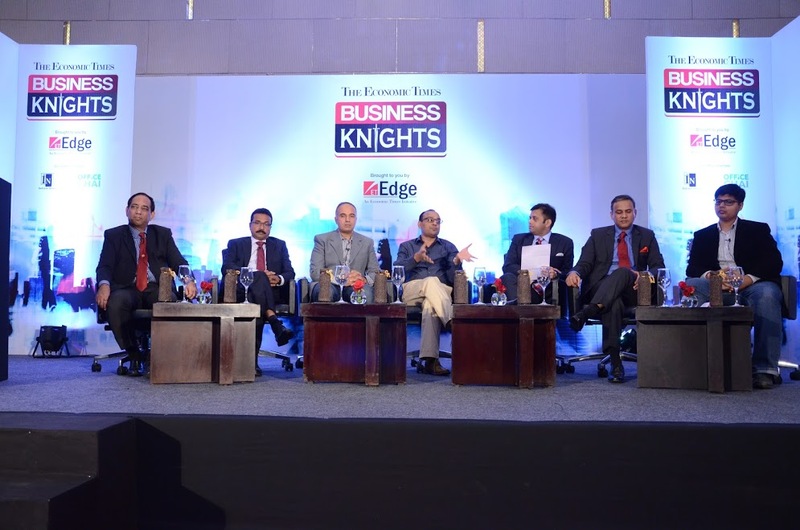 The Economic Times Business Knights Summit- an event recently organised by ETEdge – An Economic Times Initiative brought together renowned Business Leaders as they looked to provide strategic insight and direction for the betterment of India’s business environment and the country at large. The event was attended by the who’s who of the business world in India. It served as the platform that showed India’s entrepreneurial spirit is well and truly thriving. It was vastly agreed that under Modi regime the Indian economy is looking more positive than it has in years and boosted by the influx of the FDI in the economy, things are looking up. The event was largely centered around the following points of discussion. India has recently seen a dramatic amount of buoyant optimism surrounding its economy following a revision of its GDP and consumer price index (CPI) estimates. Using new data sources and a revised base year, the numbers shared by the government hint that the growth of the economy has been more robust than expected, perhaps even closer to that of China than expected. However, a vibrant entrepreneurial spirit is central to any booming economy, and when it comes to technology usage and MSME’s, there is a lot to be done going forward. The government must ensure that its promises are executed even as it tries to balance the dual demands of balanced and sustainable growth across multiple segments of the economy. With the heavy hitters of the corporate world putting India under the proverbial magnifying lens, perception becomes an important building block in order to invite investments into the country. While business sentiments within the nation are bullish, expectations from opinion shapers internationally are more cautionary. For example, the Global Competitiveness Report of the WEF puts India at a competitive disadvantage in terms of macroeconomic environment, infrastructure, institutions and labour market efficiency. India’s business environment is also affected by the absence of adequate infrastructure and the high cost of doing business. However reforms across the financial, equity and banking sector can be seen. India’s success story in becoming one of the world’s foremost economies purely on the basis of the velocity of its growth is a remarkable one for a very simple, but not always obvious reason. While most economies of the world surged to prominence on the back of their manufacturing industries, India has marched to the beat of its own drummer and surged on the back of its services sector. In fact, while the services sector has been vibrant, the manufacturing sector has been more stagnant since its contribution to the nation’s GDP has been constant for very nearly 3 decades. A weakening in the ability to generate adequate employment, weakening of global demand, and general economic uncertainty held back the Indian manufacturing sector. The manufacturing sector in India has been slated to reach $1 trillion by 2025, thereby contributing approximately 25 to 30 per cent of India’s GDP and creating approximately 90 million jobs by 2025. With the government looking to focus afresh on manufacturing via the Make In India initiative, this can only serve to give a fillip to the sector. A few concerns however, remain. Manufacturing alone cannot be responsible for buiding the country. Infrastructure will also play a key role. Only 20% of national highways are 4 lanes, for example. Even capacity at airports is abysmally low. Businesses need this support if they are to reach their full potential. India is in a very unique position right now. We are one of the fastest growing economies right now, our GDP has surpassed China’s for the last 2 consecutive quarters and we are considered to be one of the most preferable investment destinations. Things are most definitely looking up. However, when we talk about economic growth, it is also about having even, inclusive growth for all. By 2020, our population will be an estimated 1.35 billion, of which 70% will be youth of a working age. There are a lot of things happening at the government level and this is pushing along the overall scenario, and our states are looking to attract investments. There is thus a lot of intent and positivity for improving the overall environment of the business ecosystem. While all of this is very positive and this looks like the defining decade for India, there are challenges we need to address. One of these is about creating jobs for our youth. Our economy is driven by the service sector, which constitutes 57% of our GDP whereas it contributes 30% to the total job creation. Agriculture is one of the largest employers, and a lot of the jobs it offers are going to dematerialize as we move forward. India is the land of opportunity for those who are job-ready. But this very job-readiness is what the business environment lacks. There is an immense need for skill-gap training across various sectors. It is not an exaggeration to state that the bigger problem today is ‘unemploy-ability’ compared to unemployment. There was an era where mediocrity was enough to land a plum job with an attractive package. However today companies are increasingly looking to hire a skilled workforce, a quality that’s been rare in the thousands graduate every year. Entrepreneurship in India is gaining ground and this will generate the next wave of employment. In fact, SMEs and startups will be significant absorbers of talent going into the next decade. While the business environment is conducive for growth, where is the talent to sustain the growth rates of enterprises? Startups are aggressively focusing on growth and attracting sizable investments. This brings an immense pressure on business growth since it is not just about ensuring profitability but also matching investor expectations in terms of revenue and market consolidation. This will further drive the need for quality manpower. Looking ahead, India will be a hub that will cater to the globe if we ‘reap the labour’ of the demographic dividend. With almost 2/3rd of the population in the working age, India enjoys a massive advantage among global peers. The lop-side is that if this working segment is unprepared for ‘the job’, the notional advantage would actually turn into a factual disadvantage.